In nineteenth-century China, in a remote Hunan county, a girl named Lily, at the tender age of seven, is paired with a laotong, an old same, in an emotional match that will last a lifetime. The laotong, Snow Flower, introduces herself by sending Lily a silk fan on which shes written a poem in nu shu, a unique language that Chinese women created in order to communicate in secret, away from the influence of men. As the years pass, Lily and Snow Flower send messages on the fan and compose stories on handkerchiefs, reaching out of isolation to share their hopes, dreams, and accomplishments. Together they endure the agony of footbinding and reflect upon their arranged marriages, their loneliness, and the joys and tragedies of motherhood. The two find solace in their friendship, developing a bond that keeps their spirits alive. 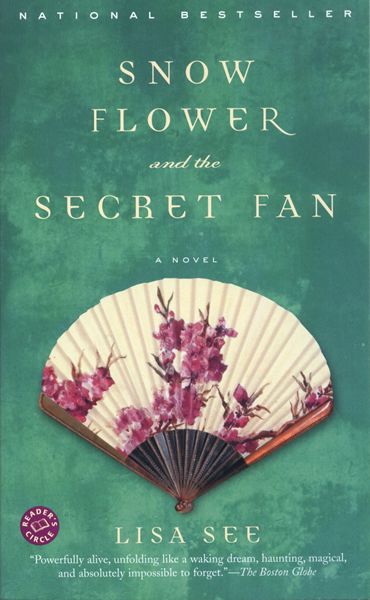 "The exotica, fetishism and soap opera in Lisa See's novel of 19th-Century China, Snow Flower and the Secret Fan, make for a fragrant mix. Ms. See has worked enough joy, pain and dramatic weepiness to give it a quiet staying power." "A beautifully composed work. Fully incorporating its historical and philosophical underpinnings into lively, at times heartbreaking prose, Snow Flower and the Secret Fan deals with timeless issues while evoking a forgotten era." "See's fluid language... is engaging. See ably illuminates the roots of Lily and Snow Flowers heartbreaking passivity, allowing us to identify with them enough to recognize the meaning of their lives despite the cultural restrictions of their time."